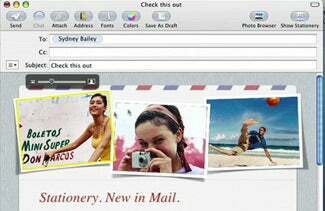 Editor’s note: Our ongoing examination of the newly announced features in the next version of OS X continues, with a look at what to expect from Mail when Leopard ships in 2007. No matter what else you use your Mac for, chances are that your e-mail client is one of the programs you keep open almost all day long. As such, it tends to become a repository for more than just messages—reminders, to-do items, and other snippets of random information can clutter up even the tidiest of inboxes. With Mail 3, the upcoming version of Apple’s e-mail software that will be included with OS X 10.5, Apple attempts to help users better manage these bits of information via a new Notes feature and improved integration with iCal’s To-Do items. The new version will also offer templates for creating graphics-rich e-mail messages, and new support for RSS feeds. Mail not only checks for and lets you respond to incoming messages, the built-in e-mail client also helps you organize messages into mailboxes, either by dragging messages into a mailbox or by creating smart mailboxes that automatically collect messages meeting a certain set criteria (for example, any messages sent from your softball teammates). From what Apple has shown, it appears that none of the basic functionality of Mail has significantly changed from what Tiger users have become accustomed to; however, Mail 3 does offer some completely new features. In Mail 3, you can use a new type of message, called a Note, to store information that you want to keep track of. Notes feature a yellow background and can contain graphics, colored text, and attachments. All notes appear in a generic Notes mailbox, and you can create additional mailboxes to further organize notes—for example, keeping notes related to your job in one mailbox and notes about the kids’ schedules in another. The notes feature offers an easy way to keep track of details that might otherwise get lost in your inbox, such as electronic flight confirmation details for an upcoming trip or directions to a friend’s house. Create to-do items by highlighting text within a note or message and clicking the To Do button. If an e-mail message or note contains action items, such as deadlines for a project or a reminder to pick up your daughter after school, Mail 3 lets you designate these as To Do items. You can create to-do items by highlighting text within a note or message and clicking on the To Do button or by making one from scratch in the main Mail window. You can give the item a due date and a priority, set up an alarm, and associate it with one of your iCal calendars. Like notes, to-do items appear in their own mailbox. They also appear in iCal’s To Do pane. You can check off to-do items as you complete them, and you can send to-do items to others via e-mail. Because notes and to-dos are stored along with e-mail messages, you can access them from anywhere that you can access your e-mail. Mail’s new Stationery feature is less focused on productivity than it is on sending attractive e-mail messages. Similar to features built into iWeb, Mail 3 lets you place images and text into HTML templates that you can then send to others via e-mail. Mail will feature 30 templates, including those for birthday invitations, baby announcements, vacation updates, and so on. You can quickly add photos and other graphics to the template via the Media Bowser then customize the template’s placeholder text. You can also apply templates to e-mail messages you’ve already composed. Once you’ve dragged photos from your library onto the Stationery template, you can zoom in using a slider tool. The resulting e-mails use standard HTML to display your graphics and text. Of course, recipients will have to be using an e-mail program that supports HTML e-mail in order to see the graphics. But according to Apple, even in programs that don’t automatically display graphics, the text of your e-mail will appear. Apple has also added RSS features to Mail 3, letting you stay on top of your favorite RSS feed (basically a site’s headlines) without ever leaving Mail. A new RSS mailbox lets you easily move between different RSS feeds. You can also create smart mailboxes that filter RSS items based on your own criteria—for example, to quickly find any posts about your favorite celebrity or to keep track of an issue that interest you. RSS articles also appear in Mail’s inbox. According to Apple, Mail 3 includes improved security features that protect users from phishing—e-mail scams that purport to be from trusted institutions such as your bank in hopes that you’ll hand over your account information and open yourself up to fraud and identity theft. However, the company has not offered any additional details. Mail has come a long way since its first incarnation to become a full-featured e-mail application. Many of the new features in Mail 3 will be a welcome addition for users who keep Mail open in the background all day long and want a single application where they can keep track of information, reminders, and the latest headlines alongside their messages. The stationery feature will appeal to users who want to send out attractive invitations and announcements via e-mail. However, the new features may not be enough to convince power users to abandon more powerful e-mail apps, such as Microsoft’s Entourage. There’s no word yet on whether the application’s search features have been improved, and little detail on the program’s improved security tools—though certainly I applaud any effort to combat phishing. It also remains to be seen whether Apple has beefed up the program’s mail rules to allow for more complex actions, such as changing subject lines or stripping out attachments—on incoming Mail. Apple’s Mail is already a very capable e-mail application—especially when you consider that it’s free. New bells and whistles, such as Notes, To Dos, RSS support, and stationery templates, expand the program’s reach and make it more of a multitasking tool. However, if you’re using a third-party e-mail application because you need powerful management features not offered by Mail, these additions alone aren’t likely to change your mind.